When the U.S. drops the “mother of all bombs” on Afghanistan as a worldwide message, it’s time for a little sobering perspective. Maybe we could take a little more time to treat all people with a little more respect, fairness and dignity in our everyday lives. Person to person. And certainly, corporation to consumer. Which brings us to the viral bombshell of a story that won’t die. If United, or anyone else, thought the dragging of Dr. David Dao was a short-term headline that would go away with a simple apology, they were sorely mistaken. Dao’s tale is bigger than anyone thought. It’s soon to become the last stand for the modern global consumer. 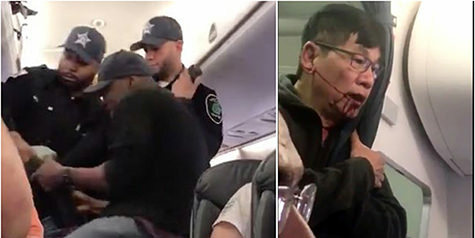 Dao, the 69-year-old man dragged off a United flight so that the airline could seat its own employees, has hired Thomas Demetrio, a top-notch personal injury lawyer based in Chicago. At a press conference Thursday, Demetrio made it clear how he saw things. In other words, he’s the universal little guy. But race did come into play in one significant way when Dao told Demetrio how he felt about the dragging. On one of the phone videos released, Dr. Dao was seen crying out, “just kill me, just kill me.” A reporter asked what Dao meant by that? If there’s a lawsuit coming, and indeed there is, I don’t think United stands a chance. As a writer on race issues in America, I’ve often wondered what one factor in our society could become our common ground and end the pain of discrimination. Twenty years ago, I thought age would allow us to see beyond race. The ageists of the world have proved me wrong. In Dao, a 69-year old loving father with multiple grandchildren, I think we have the answer. He’s the battered consumer in this angry, short-tempered society, standing up to the corporation. Race? Not primary. It may have helped the Chicago Airport cops to see him as an “other” so they could drag him away with zeal. But basically, race is irrelevant. Dao was a seated ticket holder, a profit center to the corporation. And when it didn’t need him anymore, it violently bullied Dao and treated him like crap. We can all relate to that. It’s what I thought on Monday when I first heard the story. Now Dao is poised to become the one who fights for what all consumers deserve. It’s not the position that most Asian Americans willingly seek out. Most hold on to the stereotype–unless you are chosen, and it’s beaten out of you. 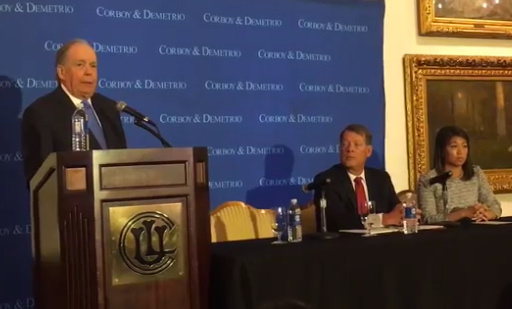 Dr. Dao wasn’t at the press conference. Hear bits of the media conference in Ep. 9 of the AALDEF podcast Emil Amok’s Takeout. I also interview an Asian American from Kentucky, Mimi Hwang. She talks about the local reaction to Dao, who lives in the Louisville area, and gives her own perspective as a business owner and as someone who has experienced what it feels like to be bullied due to her Asian background. It happened to her family in 2015. She also says that while the Dao story is empowering, the micro-community of Asians has little voice and no support from social justice organizations. I even mention if the community has heard from Elaine Chao, Secretary of Transportation, who happens to be the wife of Kentucky Sen. Mitch McConnell. No, Hwang said. But she’d welcome Chao’s support in the community. Listen to Episode 9 on the Dao case on the AALDEF podcast, Emil Amok’s Takeout.